You dont want to do without sprouts! Its just amazing how such little things could have such a huge impact on your health. Grains and legumes have both been declared as nutritious and a necessary part of our diets. What most of us havent been told is the best ways to eat them. Sure cooking these little fellows may be of some benefit...they will keep you alive in famine, but they are not the most nutritious foods to live on. But sprouting them however is another matter! 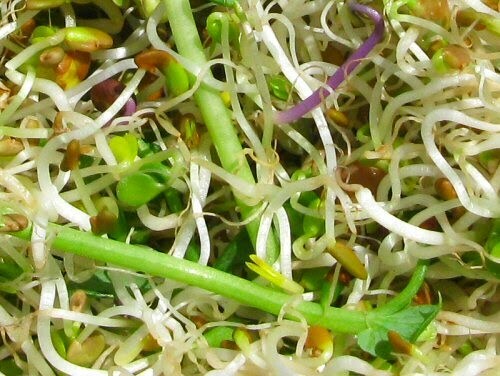 Sprouts are alkaline foods,and our diets must be made up of at 80% of Alkaline foods to maintain a healthy state. *Sprouting increases enzyme activity from 6 to 20 times! (Enzymes are absolutely essential, for the body to work efficiently ... are vital for life. When we are low in enzymes, our entire health and wellbeing are adversely affected . *Sprouting increases B6 by 50% and B2 by 1300%!! So the bottomline is -Eat sprouts regularly, as they are nature's wonder food, rich in the essential alkaline minerals, and are the most nutrient dense foods we can eat.